Ratio have been offering cashless vending solutions in Ireland for over twenty years. Early cashless systems were based around tokens. The next generation of cashless vending machines made use of closed systems, often linked to personal access cards in large organisations. These systems offer increased functionality from a single card, including access permissions, control of free refreshments, and “top-up” facilities for users to access vending machines. These solutions are robust and we have been using them successfully in large vending sites in Dublin and Belfast for many years. So, why do we think the latest cashless vending systems are a “game-changer”?! For one simple reason – flexibility. The latest cashless vending machines can be configured to accept payments from credit and debit cards, mobiles phone, proximity access cards, and bar-code based membership cards. 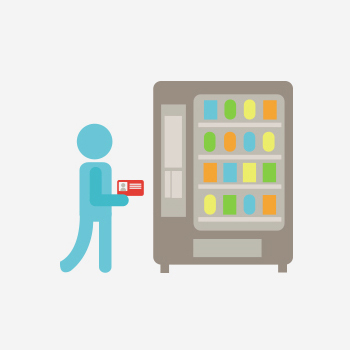 Facilities managers across Ireland can now enjoy enhanced control over the vending services that they offer their staff, whilst increasing the quality of service they provide to the general public. For more information about the latest cashless payment solutions for your vending machines just contact one of our experts!